A distinctive look at the winners and losers in US abortion politics. Historian Solinger (The Abortionist, 1994, etc.) makes a dynamic argument that the concept of choice, as it was introduced into abortion-rights rhetoric shortly after Roe v. Wade, has contributed to social stratification along economic and racial lines. By promoting abortion as a choice, rather than a right, advocates set the stage for the state to deny public funding to women, making abortion a choice only for those who can afford it. The impact of this language does not end with abortion, argues Solinger. The concept of choice fosters biases that have played into the national dialogue on abortion, adoption, and welfare over the past several decades. Choice imbues motherhood with consumer dynamics, where some people make what are perceived as bad choices and some good. 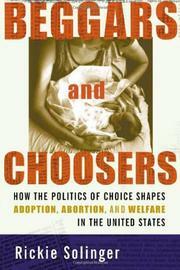 Solinger stresses how the concept of choice produced “scorn for poor, unwed mothers” in the 1970s, giving rise to the view of “Welfare Queens” as “illegitimate consumers.” “Simple ‘choice’ actually underlies the very popular (though much denied) idea that motherhood should be a class privilege in the United States,” she writes. Choice has shaped the nature of adoption, virtually punishing American and foreign women living in poverty, while creating a global baby supermarket for the more wealthy. This approach views the issue of choice through a broad lens, focusing on the social by-products of the abortion debate rather than the morals of reproductive rights. Solinger gives a strong sense of the environments—past and present—in which American women’s “choices” are made by blending personal and official testimony. The argument is a complex one, and though compelling, takes quite a bit of work to follow. A well-documented examination of the far-reaching effects of political rhetoric—and a strong reminder that choice and opportunity are not always bedfellows.